A W-4 is an IRS form that an employer uses to gather tax withholding information for an employee. A W-2 is a year-end tax document that’s required by the IRS and used to report an employee’s annual income and taxes. We’ll compare both in detail and walk you through when and how to use each of them. Disclaimer: Tax laws change frequently. For the most up to date information please refer to the IRS.gov website or your payroll/tax accountant. The difference between the two tax forms is that a W-4 is an input document and a W-2 is an output document. An employee uses a W-4 to inform the company’s payroll department how much tax to withhold from their earned income. Then, at year end, a W-2 reports year-end earnings and deductions. The W-2 is provided by the employer to the employee, summarizing gross pay for the year. It includes information on how much was taken out of the employee’s gross pay for deductions, like state and local taxes. If you’re spending too much time with payroll and compliance, consider using an integrated HR and payroll software like Zenefits. This powerful platform saves you time and money by instantly pushing any changes to your employees’ HR records, benefits, hours, and time off straight to payroll. Zenefits also helps you stay compliant with Federal and local regulations by eliminating the human error that comes with entering data manually. Click here for a free 14-day trial. A W-4, which is the employee’s withholding allowance certificate, is typically provided once an employee has accepted an offer of employment. It needs to be completed prior to the first payroll. The payroll department will use the information on the W-4 to determine how much federal, state and local taxes need to be taken out of the employee’s paycheck, based on what they employee chooses on the W-4 form. If an employee fails to complete the W-4 before their first payroll cycle, the company should process payroll as if the employee had chosen single with zero allowances. They could also use the employee’s W-4 from the previous year. Once completed, a copy of the signed W-4 form is to be kept by the employer because the IRS may request a copy. An allowance is a number clarifying what tax rate should apply. A worksheet is provided in the W-4 instructions to help calculate it. In general, the higher the number, the less tax withheld. For example, a single parent with two children might choose an allowance of 3, whereas an unmarried single with no kids might choose an allowance of 1. An employee can claim a W-4 exemption if they expect their wages will result in no tax liability. For example, if the standard deduction for a married couple is $24,000 and your sole-wage-earner employee knows they will earn less than that, they may want to consider claiming an exemption. Here are the rules for claiming an exemption from withholding. Several states also use the W-4 as is to determine state tax withholdings, such as Colorado, Minnesota, and Mississippi. The IRS suggests you write ‘State Withholding’ on the state-version of the W-4 form. However, some states, like Alaska and Texas, have no state tax withholding requirements so they’d don’t need to have a state withholding form. Most other states have their own state tax withholding form similar to a W-4. For example, in Georgia it’s called a G-4 withholding form, in Illinois it’s an IL-W-4, and in Kentucky, it’s a K-4. For a complete listing, take a look at state-specific tax forms provided by the Bureau of Labor Statistics (BLS). Where to find a W-4? The W-4 Form is provided to the employee by the employer. It’s also downloadable from the IRS website in English or Spanish, or available through your online payroll provider. It’s not uncommon for employers to require this form, along with I-9 and other documentation, to be completed during onboarding and prior to the employee’s first paycheck. Once the employee completes the federal W-4 (and similar withholding documents required by the state), it should be filed in the payroll file or employee’s personnel folder. To streamline your payroll process, consider using a payroll software that manages W-4 and I-9 forms as well as year-end taxes—all online and paper-free. Zenefits helps you manage payroll, HR, benefits, and time-tracking in one easy-to-use platform. If you’re already using another a provider, Zenefits integrate your HR and benefits data with popular payroll systems, including Gusto, Intuit, OnPay, and Paychex. Click here to try Zenefits free for 14 days. Officially an IRS Form W-2 Wage and Tax Statement, the W-2 is the year-end tax document. It provides information on the employee, their earnings (gross pay, bonuses, tips), and any deductions taken out for taxes, savings/retirement, and/or childcare. 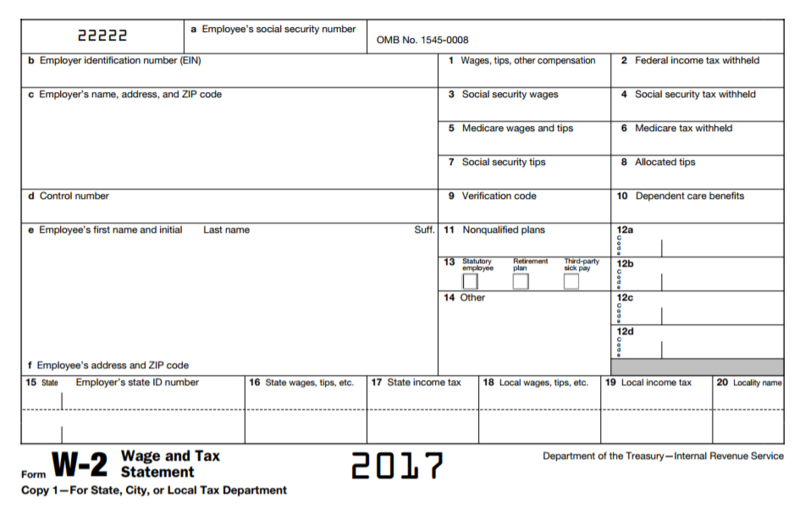 The W-2 Form is provided by the employer to current and former employees at year end. Typically, a business will provide W-2s electronically to the IRS while sending them through the mail to all employees who worked during that tax year. You can download a blank document from IRS.gov along with instructions. In addition, the IRS provides customized W-2 forms for American Samoa (W-2AS), Guam (W-2GU), and the US Virgin Islands (W-2VI). The IRS requires that a W-2 be sent to the IRS and employees by January 31 for the prior tax year. For example, for 2018, W-2 forms must be sent by January 31, 2019. It’s provided for every person who worked for you as an employee during that prior tax year — whether still employed with your company or not. However, some payroll software provides self-service options that allow employees to download their own year-end W-2. That’s helpful in case they’ve moved and you don’t have an updated USP mailing address. You can send them a secure email link to their W-2, meeting IRS requirements and making it possible for them to file their taxes. Contractors don’t typically receive a W-2. Instead, they receive a 1099-MISC. For a summary of the differences between a W-2 and 1099, read our article here. And for the differences between a W-9 and 1099, read our article here. W-4s and W-2s are related — both are IRS tax documents, but the W-4 is the input form, used to gather employee information, and the W-2 is the output form, provided at year end so that employees can file their taxes. Keeping them straight and explaining the difference to your employees may help them maximize their tax refunds. Whether you’re a growing company onboarding new employees or simply looking to free up time from running payroll manually, check out Zenefits. It lets you manage payroll, HR, benefits, and time-tracking all in one place so you can stay up to date on earnings, deductions, and taxes without lifting a finger. Click here for a free trial.